Our Consultation Service ensures we meet your specific needs. We believe that good communication between stylist and client is essential , therefore on every visit, whether you are male or female, you will receive a comprehensive consultation. This will allow us to work with you to create your perfect style, and advise on home care to ensure manageable, healthy hair. After the initial consultation to discuss your skin tone and colour requirements we will establish the best techniques required. At albemarle we use the Wella range of Koleston Perfect permanent and Colour Touch semi permanent colours. Please note that all customers are required to undertake an allergy patch test 48 hours in advance of colour services. We can combine this with a colour consultation prior to your appointment. Please call the salon for further information. If you struggle to manage unruly hair, we can provide the ultimate solution with a Keratin treatment. We can offer a product that will ensure up to three months de-frizzing and smoothing whilst leaving your hair moisturised and hydrated. There are cheaper versions on the market, but since its launch in 2007, Keratin Complex has led the way with innovative technology and amazing results. It's no wonder Keratin Complex is now the leading smoothing system in the World! 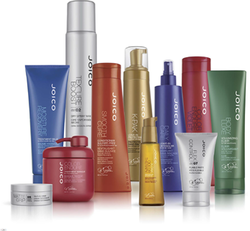 Using the JOICO hair rejuvenating system we will advise you on a personalised hair treatment to ensure your scalp and hair’s best possible condition. This product optimises chemical treatments and delivers strong, healthy, beautiful hair. Monday to Saturday, 9am til 6pm. Copyright © 2008 - 2016 albemarle. All rights reserved.